Cape Town - VfB Stuttgart's mid-season training camp in Cape Town may have come to an end on Thursday, but Thomas Schneider's team still had time for one final excursion before returning to Germany ahead of the second half of the 2013/14 Bundesliga season. On Wednesday, the players and coaching staff hiked up the Lion's Head Mountain in Cape Town, before taking a cable car to the top of the Table Mountain, where they enjoyed a spectacular panoramic view of South Africa’s second-largest city. If Schneider's charges had expected a gentle stroll up the 600 metre-high Lion's Head, they were sorely mistaken. "It really got the heart pumping," said midfielder Christian Gentner afterwards. "It was fantastic, I absolutely love climbing mountains, and for all of us this was a very special type of warm-down. It was really enjoyable for most of us, but it gave some of the players a real fright!" 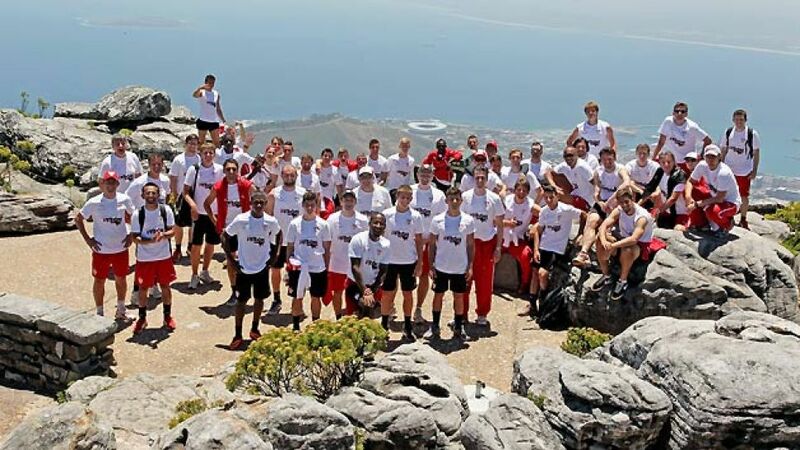 Gentner and his team-mates were given time to catch their breath - and take plenty of photos - at the top of Table Mountain, which offers a 360-degree view of Cape Town, the Atlantic Ocean and the neighbouring peaks. Back on lower ground, the VfB players then took to the beach to enjoy a few more rays of South African sun, before attending a group meal to mark the end of their ten-day training camp. It has certainly been a trip to remember for the Swabians. As well as working on their fitness ahead of the Bundesliga Rückrunde, the team have also paid visits to Robben Island - where the late Nelson Mandela was incarcerated for 27 years - as well as Cape Town's Philippi Township, where they were able to show off their skills to the local children. "I think that these excursions have also made an impression," said VfB president Bernd Wahler. "We have received a very warm welcome from the sport-crazy South Africans and especially from the guys at Ajax Cape Town. We can all definitely envisage coming back here for another training camp." Wahler wasn't the only one to have thoroughly enjoyed the trip to South Africa. "I've been on a lot of training camps before, but overall this one was the best of the lot," said Schneider, whose team face 1. FSV Mainz 05 in their first Bundesliga game of 2014. "There's been a perfect balance of sport and culture. We'll certainly be taking a lot of memories back home with us." "The idea was to get to know the people and the place, and it's worked perfectly for us from day one. It sets us up well for the remainder of the season," added Gentner. "Now we want to start moving up the table a bit, so it’s quite appropriate really that our training camp should finish at the top of the mountain. We can continue on this path back home."